The 4R Research Network is composed of up to 10 leading Canadian researchers who will qualify economic, social, and environmental benefits resulting from advanced fertilizer management systems under 4R Nutrient Stewardship(Right Source @ Right Rate, Right Time, Right Place). The project will emphasize collaboration with university researchers, professional advisors, provincial agriculture departments, and Agriculture and Agri-Food Canada researchers. The research covers many areas of environmental focus including reducing greenhouse gas and ammonia emissions, losses of phosphorus to surface waters, and nitrate leaching in groundwater. Activities, including field trials, cover key field crops across Canada and were selected to overcome gaps in adoption, such as: lack of best management practices (BMPs), evaluation of multiple nutrient loss pathways of nitrogen and phosphorus, evaluation of BMPs under the diverse soils, weather, cropping systems in Canada, and decision-making tools for tailoring BMPs to local needs and conditions. The 4R Nutrient Stewardship framework delivers Canadian growers the information they need to enhance competitiveness and increase productivity and adaptability to market needs while addressing the sustainable intensification of agriculture. The result will be science-based data that demonstrates, through agronomic research, the benefits of the 4Rs for improved farmer decisions on economics, feeding the world, and protecting the environment. This research initiative will serve to strengthen the science behind 4R Nutrient Stewardship principles in a way which will be profitable for farmers, meet society’s need for increased food production, and improve the environmental performance of farming practices. Read the full Key Findings of the Canadian 4R Research Network. 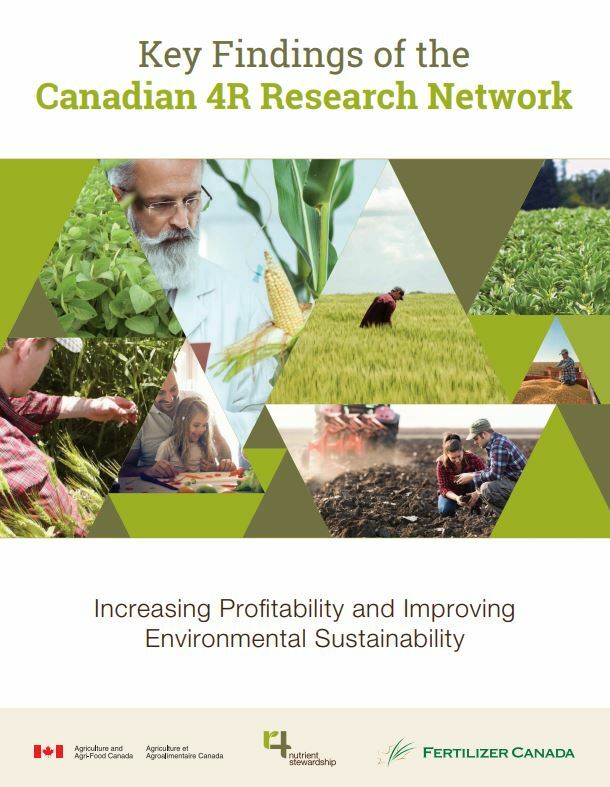 Read the full Canadian 4R Research Network Publication. 4R Research: How Does 4R Nutrient Stewardship Affect Environmental, Social, and Economic Outcomes?